One thing that I will MISS in my new HOME is the WILD LIFE. Like these DUCKS. 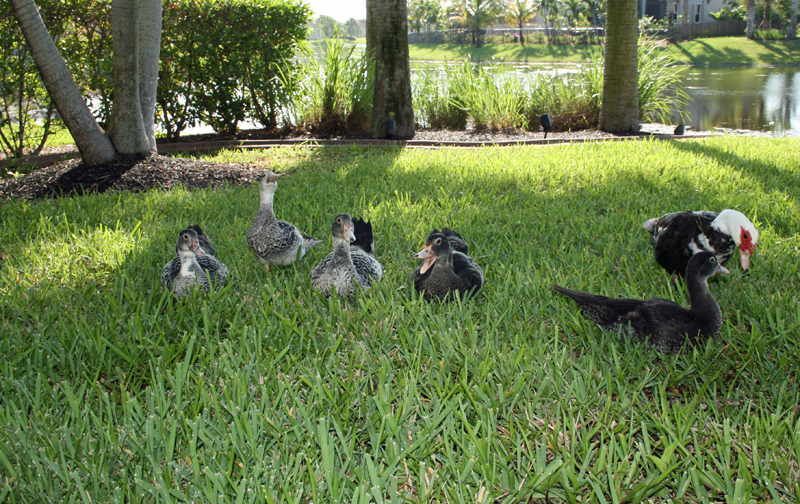 An entire FAMILY of Muscovy ducks! Daisy is AFRAID of them. I am not SKERRED! But I do not LIKE the POOP they leave behind. Yayy I'm first! Those ducks are very poopy and noisy. No more Duck TV? That is kind of sad. Those ducks do look a bit scary. What kind of tv do you have at your new house? 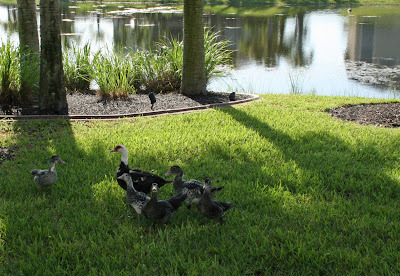 We do had ducks at we house!!! But they do not comed on we yard to pooped only on we neighbour's yard!! Daisy, we would skeeered of them too. They are big birds.I bet you will miss all the great bird TV but you will find some new stuff to watch at your new place. Take care. Poops are no fun. srsly. We think those geese look bigger than you two - we would be hiding. We had Ducks in our pool a couple of years ago They were cute but they pooped all over the pool deck. Daddy chased them away. ROFL! We love the title of this entry, Harley! But I just know you'll find OTHER wildlife out in your new digs to get acquainted with! We look forward to your "field reports"! 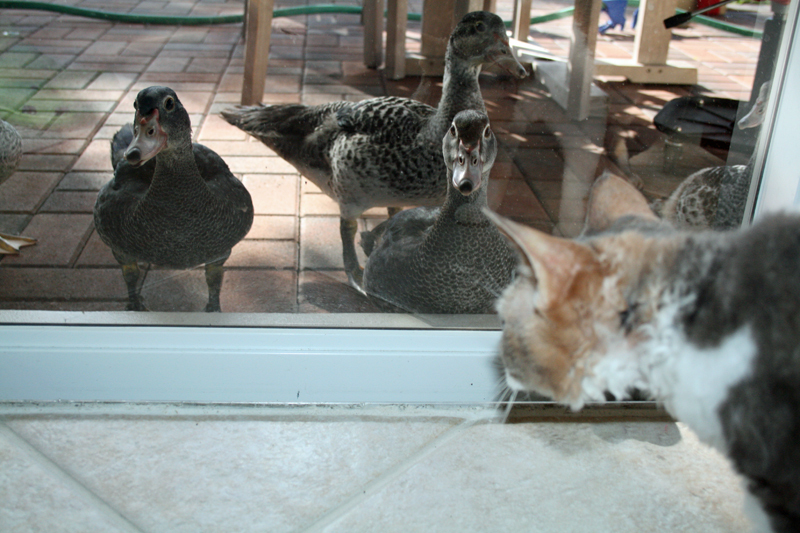 How rude of those ducks! Nope.... Left-behind poop is never a good thing. You do have a lovely home, guys. Such wonderful WildLife TV. We have mallard ducks around here occasionally. They are kind of big and slow. We don't get too excited about them. How fun! My boys would have been terrorizing! Added you to my blog roll as I was appalled to find you were not already there! So sorry! No more Duck TV? Sad! No more duck poop? Yay! Ducks and geese both scare me a little. I like Muscovy ducks. But like you Daisy, not poop. 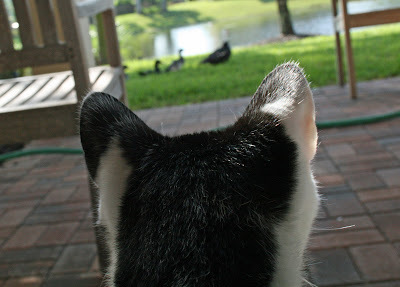 Aw, I would miss those ducks, too! Hopefully you still have a good birdie channel at your new house. They don't know how to use a litter box? Ducks are poopy. That is why they are not allowed in our pond. I think you will find other new things out your window that will be just as fun to watch. Those are very large birdies!!! Ducks are fun to watch but not to clean up after! Well Duck TV may be gone, but I bet you'll find another cool channel!!! Boids are funny because they go flap flap flap. 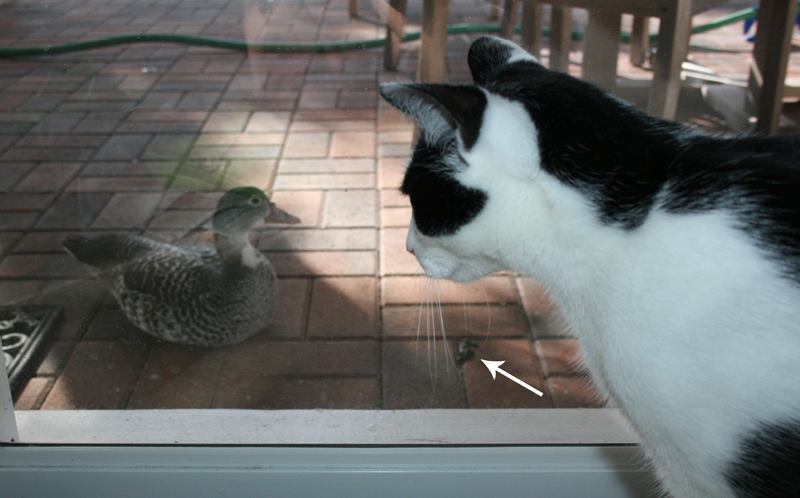 FaRADaY: That Duck TV channel was high definition 3D Harley! Up close & personal!